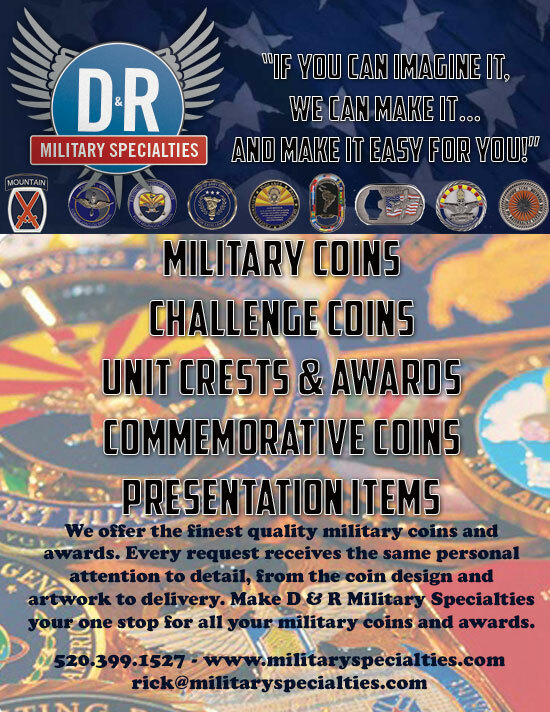 Tucson Happenings would like to thank D & R Military Challenge Coins and Specialties for their support! Thank you for considering D & R Military Coins & Specialties for your challenge coins,military coins and incentive and awards needs. A manufacturer of Military Coins, Challenge coins, unit crests, and promotional products. We offer US made coins and overseas Coins. A veteran run company. D & R was founded by and is run by retired military. We understand the importance of your coins (and other promotional products as well) as incentives and rewards for exceptional service. Your valued people, whether they are employees, team members or troops under your command, are the most valuable asset you have. Recognition awards like military challenge coins go a long way toward ensuring future top performance. D & R numbers among is long-time clients some of the country’s most senior military and civilian leaders. But we are proud of all of our customers so please be assured that you are just as important to us as are any of our valued customers. We want to make your custom medallions with the same care and attention to detail we give to each and every one of our clients. We are committed to being the best for you. These are not just words. You can speak to the owner anytime you want to. On our first communication, you will have the owner’s cell phone number!